Find the pot o’ gold at the end of this rainbow by spinning the reels on this 3 reel LotsALoot progressive game! Click here to play! The LotsALoot logo is key in this game. It is the highest paying symbol. 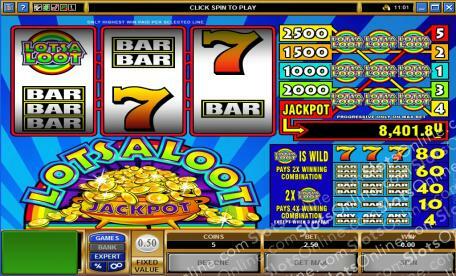 In fact, if you can spin three of them across payline number 1, you will get 1000 coins. Payline number 2 will get you 1500 coins, payline number 3 brings in 2000 coins, and payline number 4 gets 2500 coins. If you get three across payline number 5 you will get you the progressive jackpot! Plus, the LotsALoot logo is a wild symbol. Not only will it replace most other symbols to help you create more wins, but it will multiply your prize if it appears in a winning combination. If that’s not enough to entice you, there are plenty of other symbols to help you amass your fortune. Spin three lucky sevens and you’ll get up to 80 coins. Triple, double, single, or any BAR combination will also payout. So, spin these reels to find your fortune at the end of the LotsALoot rainbow. The LotsALoot logo is a wild. It will replace all others to help you bring in more wins. It will also multiply your prize by 4 if it appears in a winning combination.